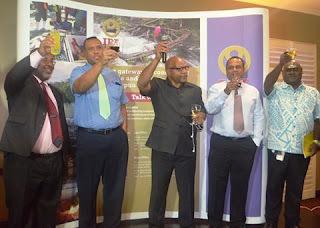 Investment Promotion Authority (IPA) convened at the Holiday Inn in Port Moresby, to observe and witness it’s achievements with the presentation of the Audit Report 2015 and Annual Report of 2015 and the obtaining of the PNG Human Resource Institute-Best Public Sector Employer Award for the second consecutive year. The Audit Report 2015, covers the period from 31st December 2014 to 31st December 2015 and as released by the Auditor General is the fourth consecutive unqualified audit and is among IPA audits that have been up to date for a long time now in which the IPA Board and Management has strived to ensure that its governance and arrangements pertaining to its account is robust and is able to meet the legal requirements. “The IPA has a strong financial accountability system, and that is backed by a board which is keen to ensure weakness is addressed, it established a Board Audit Committee whose task is to ensure that any potential issue and risks are addressed before it creates a problem and we are extremely proud of the timely manner in which we conduct our audits and this achievement,” said Managing Director Ivan Pomaleu. The IPA annual report 2015 was also presented today and this captures all the programs and implementation for 2015 in which the IPA has been embarking on a number of priority areas which include Online Lodgement Project, the Legislative Review and the restructuring of the Securities Commission of PNG which saw the first full year of the operations of the online lodgement registry. Challenges faced was important residual technical as well as legislative issues which needed to be sorted out before the registry was fully functional as intended which was also sorted out with the turnaround time for processing lodgements from 56 days to just 3 days now which is a huge achievement and now IPA is turning around Business Names registration as its clients wait with an independent reviewers findings placing the IPA website in the top five of PNG and the first for a Government Agency. “The reports (Annual and Audit) is a testament to you (IPA Staff), it is a result for all your hard work and efforts and this is a tribute to you, all of you should be proud of yourself and keep up the good work,” stated the Chairman for the Board of IPA Leo Buskins.